The Poetry Translation Centre, dedicated to translating works by African and Asian and Latin American poets into English (while further publishing the poems in their original language/script alongside), has launched a book to celebrate a decade of translations. This book, published by Bloodaxe, is just short of 400 pages and contains 111 poems by 45 poets in 23 languages (from Arabic to Zapotec). All the poems are presented in their original languages/scripts first and then in an English translation made through the collaboration of literal translators with respected English poets. It’s been sponsored by various worthy organisations and has a cover price of only £12. Bloodaxe are also intending to publish collections by some of the individual poets in the coming years. My Voice page at Bloodaxe Books. (1) Literary event in London with multilingual readings and discussions and (2) the official book launch in London with multilingual readings and discussions. I’ve been lucky enough to hear Al-Saddiq Al-Raddi from Sudan reading intensely in Arabic (modern standard, obv) and Reza Mohammadi from Afghanistan reading lyrically in Persian (Dari, amongst other dialects), and to listen to them both discussing poetry and translation in English, and I wholeheartedly recommend the experience. The title of the book is taken from a poem by Partaw Naderi, translated as "My Voice". 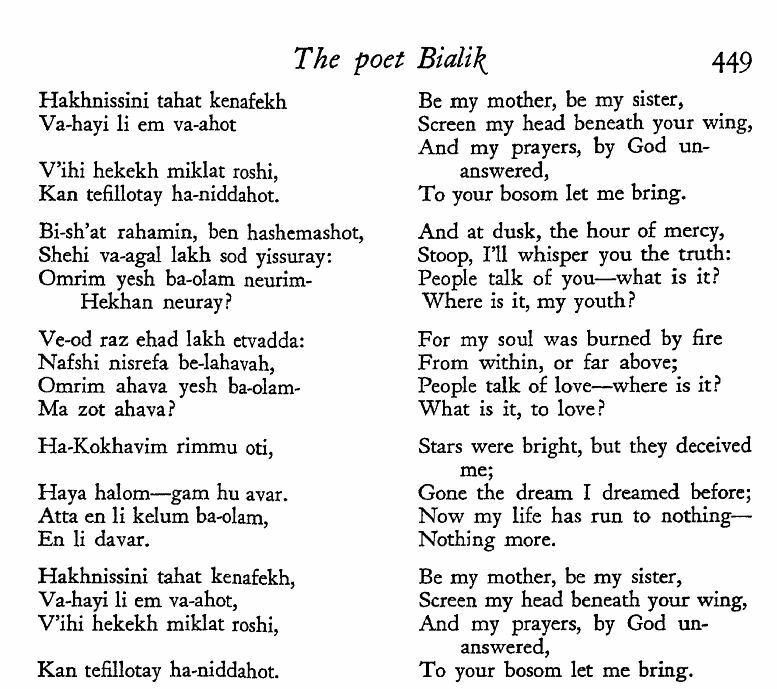 The Persian/Dari original poem. The literal translation is by Yama Yari and the poetic translation by Sarah Maguire. There are many other poems freely available on the Poetry Translation Centre website. Enjoy! Two differing translations of one Blaga Dimitrova poem, into English, at my journal (sorry, no Bulgarian original... yet...). My playlist came out fifteen songs long, of which many were recommended by this community. The playlist can be found on YouTube and the track listing is on my Tumblr. I will also be crossposting to AO3. Corrections and constructive criticism are always welcome. The title is from a translation of a Leah Goldberg poem (originally in Hebrew) which I believe has been posted here. I'm not tagging all the languages that appear in the mix because there are so many and I think DW has a tag limit. The poem is brought below in Hebrew, with translations into English and Russian. These translations were rendered in by Ze'ev Jabotinsky (born Vladimir Yevgenyevich Zhabotinsky). Jabotinsky was himself a complex figure, best known as a political leader and visionary. The Russian translation is earlier, and was published in 1916 as part of an anthology of Russian-translated Hebrew poetry. The English translation is later, presumably 1920s, and was given as a gift to Ronald Storrs, then the British Military Governor of Palestine. I cannot evaluate the Russian translation as I do not speak or read the language, but the English translation is exquisite. The translations and their background were found via this blog post (in Hebrew). I'm trying to put together a music mix of bilingual and multilingual songs. However, I'm a little limited in my familiarity and I don't want to over-represent the two languages I do speak. Of course, I'm also interested in discovering amazing new music. Does anyone have a favorite bilingual or multilingual song? One of my favorites is this version of La vie en rose in both Hebrew and French, by Corinne Alal, translated by Ehud Manor. Note to mods: Please let me know if this post is outside the community's scope, or if I tagged wrong or broke any of the rules. "The Opening of Eyes" by David Whyte @ poetry includes authorized translations of the English language poem into French, German, and Italian from the poet's website. Translators are Kim Mizrahi, Andrea Stendel, and Sabine Pascarelli respectively. manameet jo ghaav lagaaye, use kaun mitaye? madiraa jo pyaas lagaaye, use kaun bujhaaye? maajhee jo naaw duboye use kaun bachaaye? but who will extinguish the fire the monsoon awakes within? but one that is devastated in Spring, who will make such a garden blossom again? but the wounds inflicted by my Soulmate, who will heal those? but the thirst that wine leaves me with, who can quench that? but if the boatman himself sinks the boat, who can save it? Yeah, they should learn German, but which dialect(s)? http://realgrammar.posterous.com/lexception-suisse (unfortunately, I don't speak any dialect of German, so I don't know what the linked article says, or in which dialect(s) of German, beyond the summary given in Real Grammar). And relatedly, I'm wondering: which French dialect is taught first/only in areas of Switzerland where German, Italian, or Romantsch are the primary language? I posted two poems for the UK's National Poetry Day at my journal. The first is Pia Tafdrup's poem for Norway, in Danish with an English translation. The second is a humorous piece about linguistic and cultural translations written by a Scottish poet about the English and the French, and using both languages. Tang Dynasty women poem is made by a Chinese music group Mo Ming Qi Miao (墨明棋妙). These are all well known princesses and﻿ beauties in Tang Dynasty, China. Most of them languished in the sorrow of love. The bad translation is done by me. pauamma - Yeah, they should learn German, but which dialect(s)?